Sorry for the religious jokes, but we can't help it (see old post on Pita Heaven). This is a good sign and hopefully means that things are progressing (even if it's at a slower pace than we wish). 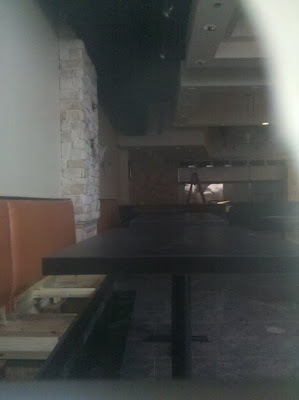 It looks nice inside, so hopefully this means the falafel will match the quality of the decor. 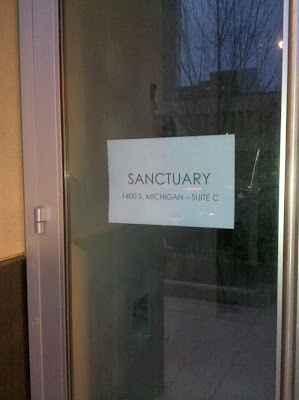 While at the bust stop today I saw a lit of "activity" (i.e., work being done) at the retail space at 1400 S. Michigan (the building where I live) and there was a sign outside that read "Sanctuary". Unfortunately, I was running late and did not have time to investigate further, but thought you would be interested in the info. Interesting. Originally we thought this might be a religious institution, but that was probably silly. Could it be a spa? Anyone know about this new place? Thanks for the community's interest. Sanctuary (opening late May) is a men's lifestyle showroom, recommending our favorite tools for entertaining yourself and your guests. Examples include great digital music systems, custom barware, beautiful pens and personal stationery, small leather goods, and gifts. Sanctuary also will host monthly talks on a wide variety of topics we feel contemporary gentlemen might find interesting. Currently scheduled speakers include chefs, musicians, fragrance experts, industrial designers, sports car mechanics, fly fishermen, golf course designers, charitable organization CEOs, and men's health MDs. Sanctuary is a comfortable yet well-appointed retail space, designed to add to our neighborhood (we've lived here since early 2006), and to draw guests from around the Chicagoland area. Please come visit us late May! Nice idea for a store! Can't wait to check it out when it opens. Thanks for the details Sanctuary Kevin. I like the idea and am looking forward to stopping by. I'm excited about Sanctuary. Not too excited about Pita Heaven or the restaurant opening in 1400 south michigan for one major reason: both spots are being opened and operated by the developer, not someone in restaurant business. Oooh, I cannot wait for Sanctuary to open. It sounds like a concept designed perfectly for me. I'm excited to see how it is executed. Kevin - late May has come and gone. Are you open yet? I am pleased to report that Sanctuary Music and Aesthetics is (finally) open, and welcome everyone to visit (Tuesdays - Sundays, closed Mondays. So what exactly *IS* Sanctuary? You sell stereo equipment? Furniture? What are your hours? Do you have a website? Cool, but will it survive? Sanctuary sounds like a concept that will be hard to keep going from a business perspective. Good luck to Sanctuary. This seems a little high end for what one called the area SoLo, SoLo is still a little ghetto. This would possibly work in Lincoln Park where people have real money to spend. Good luck though. what's SoLo? is that in NY? April Fools Comes Late to the Sloop? Power Plant Coming to Printers Row Area? So What is the Monkey Bar Gym? Shots Around the Sloop: How Do You Ride That?!? "Let There Be Light...on Day 14"
Does the South Loop Need a Master Plan? More Cupcakes Hits Michigan Ave.